Literally, breakfast is the first meal of the day, usually eaten in the morning. Typically, in our daily life, breakfast is the bread sandwich of any jam, a portion of egg either boiled, fried or scrambled and a cup of tea or coffee, some diet conscious would prefer fresh fruits. People are so busy in the fast moving era that no one get time to change their typical routine, even they are bored with it. Week days are spent with a motive of some change in day routine on weekend, but the chores on weekend don't allow them to attain their short term goal. I too sometimes get through this situation but I love cooking and I cant resist trying new food on weekends. This time, I decided to gave break to typical breakfast I'm fed up off. even I used the common breakfast items bread, eggs, onion, tomato and common spices and transformed them to new tasteful meal. It made my day and I'll suggest all of you try this out once, you'll definitely love it. 2. In a mixing bowl, Combine all the above ingredients except bread and oil. 3. Slowly add water and mix it to a thin consistency. 4. 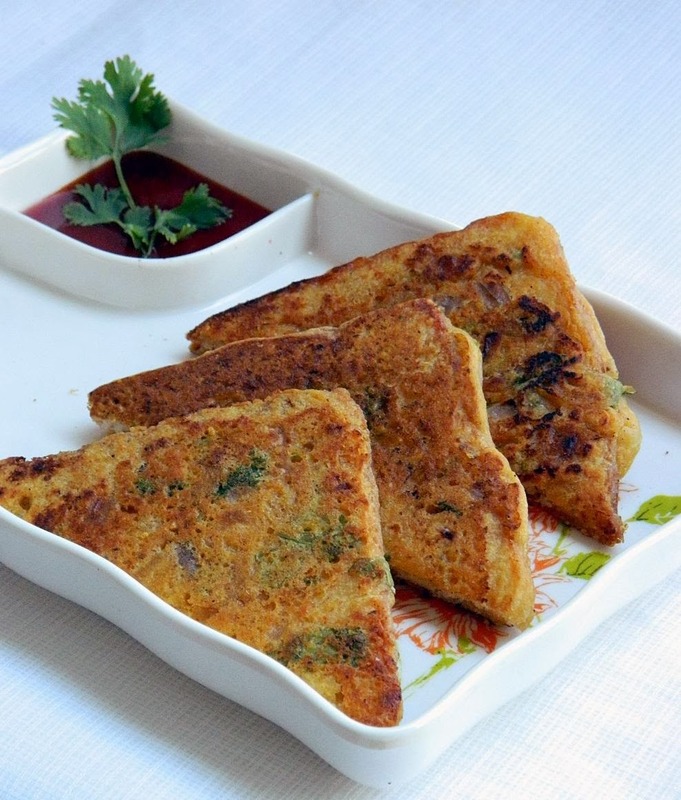 Dip the each bread slice both sides into the batter and place it on the hot tawa / pan. 5. Add oil around the edges and roast it both sides on low heat till golden color. 6. Remove from the flame and serve hot with chutney or tomato sauce. For more flavor or variety you can add thinly chopped potatoes or left over shredded chicken as well.